Whether your students are preparing to take standardized tests or you are walking them through how to write an essay, the Persuasive or Argument Essay is a standard strategy to cover. When the purpose in writing is to persuade another of your opinion, using the correct logic and following the correct layout are very important, and your arguments, if not written clearly and with support, will fall flat. When it is time to walk your students through the process of persuasion, follow this guideline on the argumentative essay to achieve a convincing result. When teaching a persuasive essay, you should make sure your students are clear on its purpose – to persuade or convince the reader that the position the writer takes is correct. This differs from other types of essays where the goal is to present information or show how something is similar to or different from something else. The persuasive essay is all about changing someone’s mind. Some topics are better suited to this type of essay, topics that can be logically argued with facts, examples, expert opinions or logical reasoning. Still, they must be a topic on which someone can take an opposing viewpoint. Some writers may be tempted to choose a matter of preference or faith, but these do not make good topics for the argument essay since it is highly unlikely the writer will be able to alter the beliefs of the reader, so encourage your students to stay away from issues of faith or preference, like ‘heaven is or isn’t real’ (since they cannot prove it,) and to gravitate toward questions they can support, such as ‘students should be able to choose their own college courses’. Though making assumptions is usually a bad idea, your students should start the argument essay with some assumptions about their readers. Since convincing the reader is the primary purpose of the essay, your students need to think about the person for whom they are writing, their audience. Knowing the audience can make the difference between a tolerable and a compelling essay. Your students should assume that the writer disagrees with the positions they are taking on their topic but they should not assume that the reader unintelligent. There would be no purpose to writing this type of essay if the reader already agreed with the writer’s position, but if the writer treats the reader as though he is less intelligent, the piece will have a condescending and offensive tone throughout. It is also important that your students think about why the reader holds the opposite point of view. This will be very important when it comes to writing the refutation. To prepare to write the persuasive essay, challenge your students to make two lists. One list should be reasons that they hold their opinion (or the pro side of the argument), and the other list should be reasons that the opposition holds their opinion about the issue (or the con side of the argument). If you are teaching a simple argument essay, the list of pros should be longer than the list of cons. If this is not the case, you may need to encourage your student to change to the other side of the argument. Your students can start with any style introduction that seems most effective, but the body of the essay should be rather straightforward. The writer should choose between two and four of the most convincing arguments and write one paragraph about each. It is very important that he supports his opinion with objective proof – facts, statistics, typical examples, and opinions of established experts – and not just statements of his own beliefs and opinions. Without this type of support, the argument will not be convincing. If you are teaching advanced students, this might be a natural place to look at logical fallacies and how to avoid them in this type of essay. Once the body paragraphs are written, have your students arrange their arguments in order – weakest to strongest – and end with the most compelling of the arguments. In this type of essay, just as important as arguing your points is arguing against the points of the opposition. When writing this type of essay, your students should not only show why they are right but also why the opposition is wrong. This part of the essay is called the refutation. Looking at the list of the reasons against their arguments, tell your students to choose the strongest point the opposite site might present. Then challenge them to think about why this argument is invalid. A strong refutation will address the argument and prove it is not logical, there is a better answer, or it is not true. Your students should spend one paragraph on the refutation, and it should come after the arguments in favor of their positions on the topic. With the most important parts of the essay finished, your students simply need to add a conclusion to finish strong. They will want to remind the reader of their points and end with a call to action. 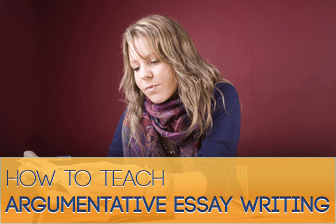 The overall tone of the essay should be logical and not emotional or manipulative. If your students are able to write this way, their essays will be convincing and effective.